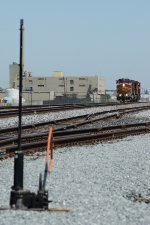 Description: Northbound BNSF detour train Valmeyer, Il UP Symbol 3QD3G4J 29 What is the BNSF Symbol? Description: A welcome Break from the Usual here on the Joint Line. Title: Another nice pair of warbonnets! Description: The second pair of warbonnets to show up on the BNSF in December sits in Eola Yard with a westbound stack train. Description: Santa Fe paint westbound on Q381. Title: BNSF 603 "anta Fe"
Description: BNSF 5072 Southbound freight starts south after waiting for a northbound empty coal train. Description: Northbound Mixed Freight BNSF Train H KCKPAS9 18 heads towards BNSF Murray Yard as a KCS Transfer from KCS Knoche Yard to KCT Mill Street Yard heads south. Description: BNSF Warbonnets mingle with a Norfolk Southern visitor near Rathdrum, Idaho. Description: The saddest looking Warbonnet I've ever seen can make even the Norfolk Southern paint scheme look good. Crew change near Rathdrum, Idaho. Description: One of the coolest stack train consists I've seen in a long time brings BNSF Train Z KCKNBY9 09 past MP 161 on the BNSF Emproria Sub., 130 miles after we began our chase of this train. You know you're on the Santa Fe when it takes you 130 miles to catch a train. Description: BNSF 603 is seen leading light power to Guernsey to put together an empty grain train it will take east. 603's trip has now been delayed, however, as it is seen holding short of CP Calabrese for one westbound Amtrak and one westbound Z. Description: The westbound 713 is seen getting a roll by from the crew of the 603 east.